Home » Bill Geiger » Legs Not Growing? Time to Make a Change! If you’re a student of bodybuilding, you know that the concept of not just overload, but progressive overload, is critical to long-term success. That is, it isn’t enough to increase the demands on your muscle fibers. As they adapt by growing bigger and stronger, you have to continue increasing the demands made on them. Still, there’s a looming setback none of us can escape called diminishing returns. Big-time gains you initially achieved when you first started a program become harder and harder to come by as the weeks and months roll by. Eventually, we all reach a plateau, a point in which further gains just won’t occur – no matter how hard we try. 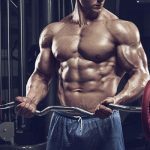 There are innumerable ways to alter the training stimulus, and some have proven better than others at achieving particular goals, be it a focus on maximizing strength, muscle size, endurance, or even speeding fat loss. An easy one I use occasionally is to simply take my current routine and then alter just one aspect of each exercise. Small changes work the target musculature slightly differently by modifying the muscle-recruitment pattern. String a whole workout of them together and you create an opportunity to achieve a more significant (and even new) training stimulus. It also forces you to keep your mind focused, thinking about what you’re doing and what you want to achieve, and the different ways to make such small changes. So let’s go through a sample leg workout and see how this strategy can be implemented. Keep some of these ideas in mind when training other body parts, which can easily be refreshed with a similar approach. Make This Change: In a power rack, allow the bar to momentarily settle on the safety bars, which are set to a point just above the bottom of the range of motion. One way to tackle what’s oftentimes the weakest point in the range of motion, which for the squat is near the bottom of the movement, is a strategy making you work harder over the lower third of the ROM. Clearly, bouncing out of the hole does just the opposite by making it easier. But you may not know about the assist you get from what’s called the stretch reflex. Training Tip: Do these in conjunction with regular squats, not in place of. Remember, let the barbell settle on the safeties to release the energy, but keep your body tight. Make This Change: Shift your feet from a position high on the sled to low (or the opposite, if that’s normally how you do them). Leg presses are an effective exercise to work the glutes, hamstrings and quads. As a machine movement, you can push yourself harder without having to balance the load, allowing you to work your muscle to failure or beyond more safely. When you re-situate your feet lower on the sled, you effectively limit the range of motion around the hip joint while increasing it around the knees. That shifts some of the emphasis from the hamstrings and glutes to the quads (and vice versa if you go the other way). This allows you to selectively target a weakness or simply insert variety into your routine. Training Tip: Foot position can also be adjusted from a close stance to wide, which alternatively emphasizes the outer and inner quads, respectively. Make This Change: Using a split stance, instead of placing your rear leg on the ground, elevate it onto a bench. When your rear leg is elevated onto a bench, more of the stress is placed on the forward leg. That makes the Bulgarian version a much more challenging movement. Descend to a point in which your rear knee is just above the floor. Ideally, your forward knee should not pass a plane coming directly up from your toes as it places more force on the knee joint. Training Tip: Doing the movement on the Smith machine helps with balance. However, here you must ensure your body is perfectly aligned, so the motion is restricted to the vertical plane. The Smith machine is unforgiving and will force you to round your back if you’re in the wrong position relative to the bar. Make This Change: Rather than position your feet straightforward, slightly rotate them inward or outward. This single-joint exercise focuses only on the quads, making it a better choice for the end of your leg workout. While it’s impossible to completely isolate any individual part of the quads, you can shift the emphasis to the inner quad muscle (vastus medialis, aka teardrop) by rotating your feet outward. By turning your feet in, you better emphasize the outer quad sweep (vastus lateralis). Don’t turn your feet so extreme that you feel discomfort in your ankles or knees. Training Tip: To be sure, it’s not just about turning your feet but rather the entire leg, beginning at the hip joint. Adjust the foot pad to a position from which it is comfortable to extend your knees. Make This Change: Switch from a knee-based single-joint hamstring movement to a hip-based one. We admit, there’s more than a single change going on here, but for simplicity it boils down to a single-joint exercise that targets the hammies from the knees to one that hits them from the hips. That’s important because most likely you’re doing far more hamstring exercises that involve knee flexion (the opposite of knee extension, as seen in the leg extension above), so you may be leaving rear-thigh muscle growth on the table. To maximize overall hamstring growth, hit them from both the knee and hip joints! Training Tip: RDLs, in which you bend over at the hips and push your hips rearward, are distinct from conventional deadlifts, a multi-joint exercise in which you also drop into a half-squat position and allow the bar to settle on the floor between reps. Know the difference: Your biggest danger here is implementing elements of each movement into a hybrid of sorts, a mistake all too many trainees make. Make This Change: Instead of doing a bent-knee calf movement, focus on a straight-legged one. If you know a thing or two about human anatomy, you know why this is important. In fact, the knotty gastrocnemius, one of the two main calf muscles, remains mostly relaxed during bent-knee calf exercises because it can’t fully stretch. You get that full gastroc stretch when your legs are straightened. That enables it to contract much more strongly. So, if you’re looking to build up that diamond in your calves, rely on standing leg raises, donkey raises, and similar movements, which target both major calf muscles, not just one. Training Tip: Because of the higher density of slow-twitch muscle fibers in the calves – the ones less responsive to growing larger and stronger – consider a variety of rep and intensity schemes to trigger growth. 1Doesn’t include warm-up sets. Do as many as you need but never take warm-ups to muscle failure. 2Choose a resistance such that you approach or reach muscle failure by the target rep.